Which ad creative will perform best against competitors? A/B testing a banner design in a production environment is not a quick process. Days or weeks can pass before reaching a point of statistical confidence in the results, depending on the amount of traffic you get. This makes a quick sanity check with a preference test or five second test a worthwhile proposition if you’re designing and running a lot of banner advertising. 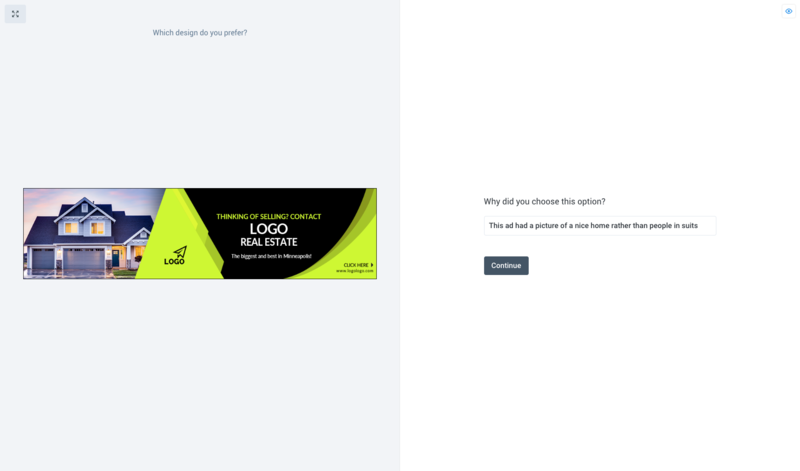 Testing banner ads on with UsabilityHub will give you a good steer on whether or not users understand what you’re trying to communicate, and what sort of visual design preferences resonate well with your message. Preference tests work well for measuring sentiment about particular color combinations, layouts, and images. It’s the simplest test to run when you’re looking for a straight ‘likeability’ measurement. Design surveys can be used to see if users understand your message. Test your designs one by one and ask questions about what the user comprehends about your ad to see which ads are doing the best job. Five second tests are great for measuring if your banner is eye-catching in the context it’ll be displayed on the web. Test your ads in-context, and ask how much users can recall about them after the fact. Preference tests give you an easy metric to determine a winner. A five second test or question test requires you to look at individual responses to find the insights but tagging the sentiment of responses with ‘positive’, ‘neutral’ and ‘negative’ labels can help you analyze the results of these tests. The value of looking at responses can be seen in the sample test results. There’s a clear winner in the preference test section of the sample test — the banner with house image, rather than team or handshake — and there’s a gem in the responses too. The first and third responses talk about the nuts and bolts of the design, but the second response articulates perfectly why the house image outperforms the other two images. It speaks directly to the aspiration of owning a home for these participants. Feedback like this can give you clear guidance in what can be a confusing process, and help you iterate through designs rapidly in the right direction.